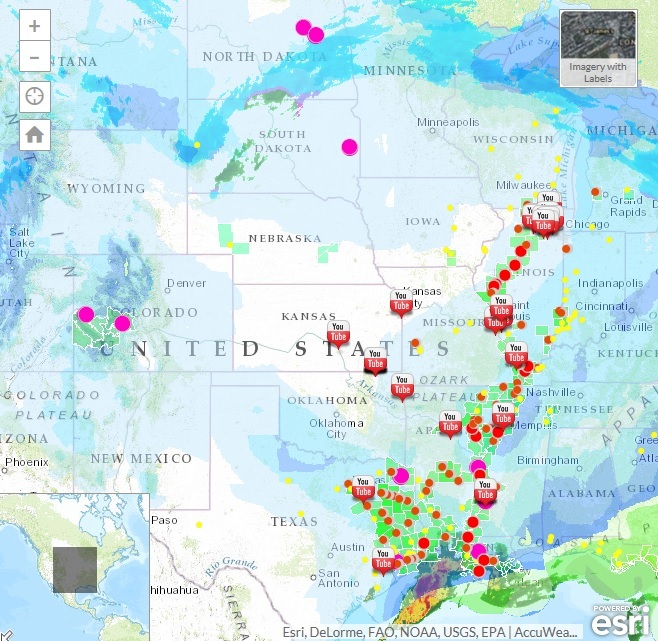 ESRI, the world’s leading producer of GIS software, and its ESRI Disaster Response Program provides software, data, imagery, project services, and technical support to organizations dealing with the recent flooding in the Midwest. Aerial photography from the National Oceanic and Atmospheric Administration (NOAA) of these affected sites is online. Supporting organizations dealing with the flooding disasters can request assistance from ESRI. Users can view continuously updated flooding information from the National Weather Service on the Public Information Map. The map details the levels of flooding from near flood stage to major flooding, and the site includes photographs and YouTube videos. Users can type in a specific address to see the conditions on a map or via satellite imagery. The 2016 Midwest Flooding Swipe Map provides a view of aerial photography from NOAA that was collected after the flooding—January 2-4. Users can swipe the map to show aerial imagery from the ESRI ArcGIS Online World Imagery (before the flooding) and then view the post-event satellite imagery. The site also provides flooding support resources. Maps, data, images, general information, and volunteer opportunities are given. The Ball State University Libraries’ GIS Research and Map Collection (GRMC) on the second floor of Bracken Library provides access to the latest GIS software from ESRI and assistance from the GIS Specialist. Computers throughout Bracken Library also offer access to GIS software.